The Franciscan Friars of the Immaculate have been forbidden by the Holy See to celebrate Mass in the Extraordinary Form. In addition to the above, the Holy Father Francis has directed that every religious of the congregation of the Franciscan Friars of the Immaculate is required to celebrate the liturgy according to the ordinary rite and that, if the occasion should arise, the use of the extraordinary form (Vetus Ordo) must be explicitly authorized by the competent authorities, for every religious and/or community that makes the request. Read all about it on Sandro Magister. Do go over to The The Bones You have Crushed May Thrill and read his article on the legalisation of drug use. It deserves to be read. 'Boney' is someone who really knows many addicts very well, and this gives his words considerable force. Recently I had to make a visit to Ireland to visit a relative who was staying in Drogheda, a town I had never properly visited before. Since I was in the area, I took the opportunity to visit the little Benedictine community at Stamullen, where the prior, Fr Mark Daniel Kirby writes his blog Vultus Christi. I found the whole operation very appealing. The house, well out into the lush County Meath countryside, is a very fine late-Georgian building with fine proportions and beautiful ceilings. The Visitation Sisters who were the previous inhabitants hadn't quite appreciated the building in the same way as the Benedictines, for they had installed suspended ceilings to halve the height of some of the rooms (including the entrance hallway) and hide the elegant plasterwork, something which perhaps served to protect it, too. These false ceilings have been removed, and work is carrying on to restore the house and make it fit for purpose as a Benedictine priory. It's a big task, and the community are impressively confident in their plans. Not only is the house being restored and converted, but there is building taking place to create a refuge for priests who need a break or a retreat. 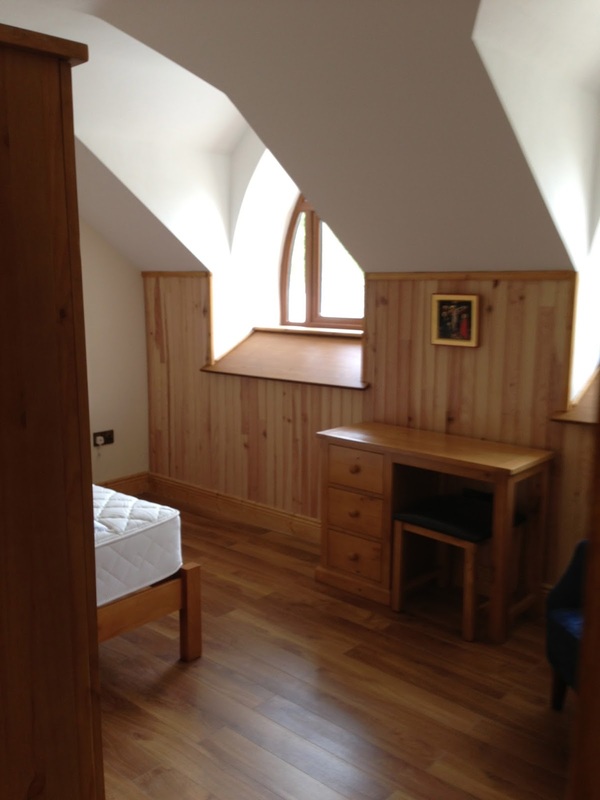 Simple en-suite rooms are being constructed, a little apart from the main house, with a small chapel, library and refectory, and even a little hermitage. You can read the story of how the little community from Tulsa, Oklahoma, came to be County Meath on the Priory's website. When I first read about this initiative, I was excited, but wondered whether it would work. Classic Benedictinism has never much appealed to the Irish, who have historically preferred the sparer Cistercian variant. That suspended ceiling hiding the elegant plasterwork is a good illustration of the general Irish preference for practicality over beauty. A weekday Mass with Gregorian chant, lasting the best part of an hour, is not calculated to appeal to the Irish. And yet, I gather there are several enquirers about vocations. And the point of a Benedictine house is to perform the opus Dei, to sing the liturgy, to pray; not primarily to run a parish. 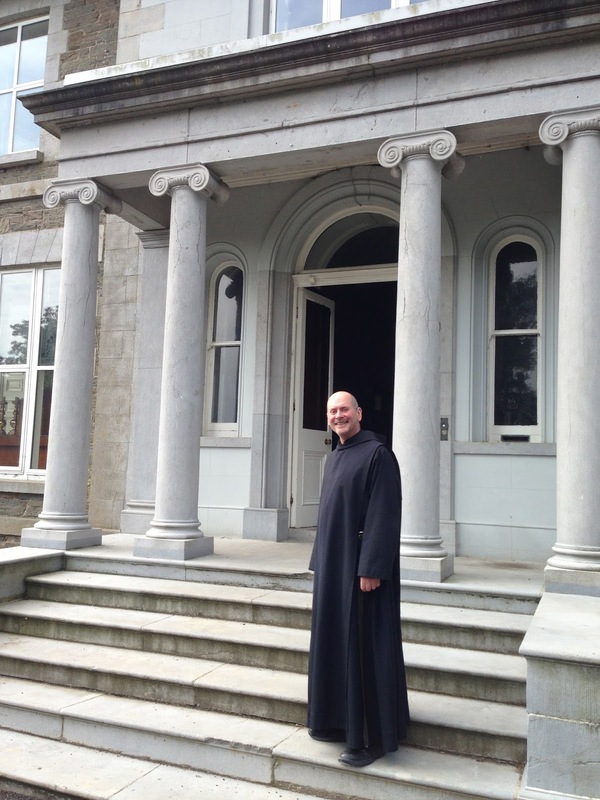 I assisted at the daily Missa Cantata at Silverstream; it was a very interesting experience. I liked the way the chant was done, neither being slavishly old-school Solesmes nor antiquarian, but nonetheless careful and well-modulated; they are clearly developing their own style. The celebrant himself acted as cantor for the Mass, from the sedilia. Though the Mass was basically Extraordinary Form, the readings were sung facing liturgical West in English (from the English Missal, therefore using the Authorised Version/King James!). Mass having been preceded by Terce, the prayers at the foot of the altar were omitted, but the celebrant began with Aufer a nobis in a medium voice while setting out the altar as at a low Mass, then returning to the sedilia to intone the Introit. The liturgical aesthetic is not the mediæval Gothicism of the French Benedictines, but rather has a counter-Reformation flavour, using Roman vestments and lace. This fits with their determination to make adoration of the Blessed Sacrament a key element in their spirituality, something not common among Benedictines. 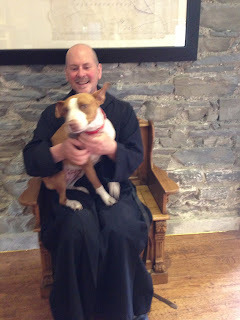 What particularly impressed me was Fr Mark's blithe confidence in God's Providence. The Priory has embarked on some serious building work, and still has to pay for the property itself. A lot of money is needed; for the time being, some important work has had to be halted for lack of an immediate €12.000. But the Prior is not daunted. He is confident that this work is of God, and that God will provide. So, if you can make a contribution, please do so. There is nothing approaching this foundation elsewhere in Ireland, and it has the capability of doing a great deal of good. You can use the 'Donate' button on this page. Dat Deus incrementum!